Where were you when you learned that Jude Law would be playing young Albus Dumbledore in the sequel to Fantastic Beasts, the Crimes of Grindelwald? Follow-up question, where were you when you first saw what Jude Law would look like playing young Albus Dumbledore? Okay, last one, where were you when you saw the first picture of Jude Law playing young hot Dumbledore while also wearing a bowler hat? The answer might be right here. 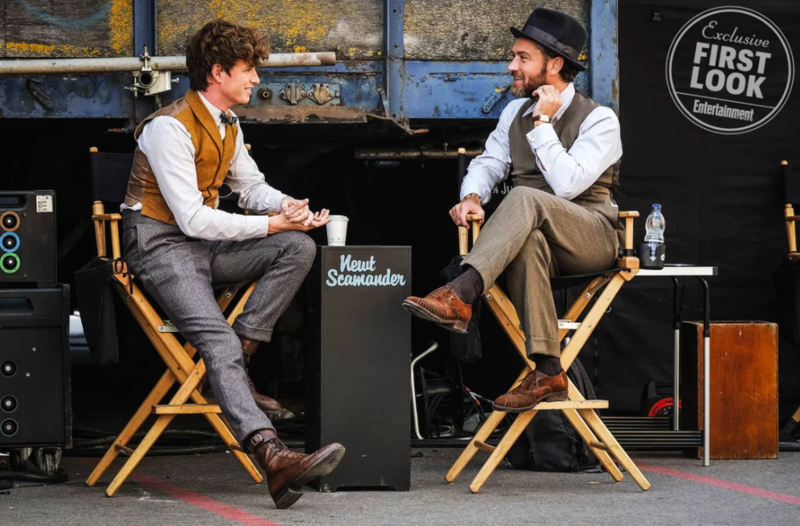 A new behind-the-scenes picture from the upcoming movie was just released, and it shows Law hanging out with Eddie Redmayne, who plays Newt Scamander. The two are deep in conversation, and also clad in their wizarding best. Newt is sporting his now trademark vest and bow tie combo (so dashing). Dumbledore next to him is wearing something we haven’t seen before – but okay, then again we have only seen one picture of him so far, and he was wearing a trench coat. Who knows what kind of threads were under that trench coat? Well, now we can see that Dumbledore is also a fan of vests (and also watches??). But most importantly, we need to talk about his choice of hats. Looks like Dumbledore was one dapper fella, because CAN YOU SEE THAT BOWLER HAT. Entertainment Weekly revealed the new picture, which would be nonchalant but the hat completely pushes it over the top. Did you ever think we’d live in a world where Dumbledore would wear such a stylish hat? I mean, the man has always been known for fun hats. But this is a completely different side of the young wizard. Also can’t help but notice that Law is wearing some boring socks. You’d think Dumbledore, a man who loves a good pair of socks, would at least be rocking something with a little color. Fantastic Beasts: Crimes of Grindelwald is still currently filming and will hit theaters on November 16th, 2018. That’s like, a solid year of more hat teases.